As a general rule, most sensory and neural systems peak in humans at the age of 2, and it is downhill from there on. There is some integration and connections between neurons that gets adjusted, but the number of cells slowly declines. Furthermore, because most neurons in the human brain (and inner ear) do not regenerate, when you lose a neuron or hair cell, it is gone forever. Discouraging but reality. As people develop better balance up through early adulthood, clearly there are other factors at work. People become better at using what they have -- learning and plasticity. There is also considerable redundancy in sensory systems. We have two of several important sensors-- two eyes, two ears, two feet -- and often we can lose one of them without entirely losing our ability to work and function in the community. Similarly, with the inner ear balance function, most people continue to work after losing half of their vestibular function to a process such as vestibular neuritis . Thus there may be a 50% vestibular reserve -- up to which people do fairly well, and after losing more function, they perform more poorly in their work and activities of daily life. Against this idea is the well known observation that the timing of their vestubular responses changes - -persons who have lost half of their vestibular input perform worse with low-frequency stimuli. An example of this is here (look at rotatory chair responses). Practically however, most persons who age continue to have normal rotatory chair responses (and caloric responses). 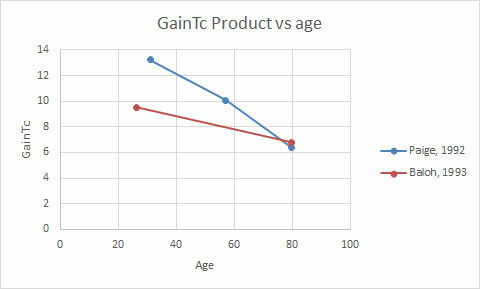 See the analysis below regarding gain-TC product however. On the other hand, otolith related responses (e.g. VEMPs) deteriorate much more rapidly. This may have to do with redundancy in the vestibular apparatus -- all of the sensors in the canals "do the same thing". On the other hand, the otolithic sensors do something different things as they are "circularly polarized", and are also far more vulnerable. If we say (roughly) that the otoliths have to resolve 360 degrees of motion while the canals only have a single axis of rotation to deal with, the otoliths have far less neural circuitry to lose. Following along with this line of thought, the semicircular canals should be resiliant to damage and age because each of the 3 semicircular canals has lots of hair cells that do roughly the same thing. You can lose 50% of your one of the three canals hair cells, and after some readjustment, carry on fairly well with the other 50%, because they all do the same thing (this is an oversimplification). Counting cells in the inner ear and in the vestibular ganglion is a method of estimating the input side of the Hair Cell and Vestibular Nerve boxes above. There presumably is also some dimunition in central and oculomotor or other output systems with age, but this is difficult to quantify. There are presently 3 well established measures of vestibular function - - caloric testing, rotatory chair testing, VEMP testing, and VHIT. One of these measures otolith function (VEMP), while the other all measure semicircular canal function. By total vestibular output we mean: the total ocular response for a given change in head velocity. This is not the same as the peak eye velocity, as the peak is a response at a particular time, that does not account for responses prior to and following the peak. The total response requires adding up all of the eye movement output over time. Lets consider how well current tests do in estimating vestibular function over time. One might argue that the caloric portion of VNG testing provides a “total vestibular output” parameter. However, this is a peak velocity measurement, occuring at a single time point, and thus is not a total response, which would require considering all eye movement elicited by the caloric stimulus. Furthermore, the caloric input corresponds to very low frequencies of vestibular stimulation, analogous to 0.003 Hz (Jacobson, Newman, & Peterson, 1997). Thus the VNG doesn’t cover the entire frequency range of the vestibular response. Nevertheless, a normal young person has roughly 100 deg/sec of total response. This corresponds roughly to 100% vestibular function (abeit for low frequencies alone). Here the term "function" is an important one, as this presumably reflects the combination of hair cells, nerve, and central plasticity all cascaded. One might lose one ear, dropping one's total response from 100 to 50, and then have a compensatory process proceed that raises the response on the remaining ear to 75. Thus the caloric total response might reasonably underestimate peripheral vestibular damage. From a systems perspective, this is oversimplified. Caloric responses probably are mainly a measure of the low-frequency vestibular response. We don't understand entirely the mapping between total caloric responses, and vestibular loss as quantified by the product of [hair cell][vestibular nerve]. This could be worked out by simply comparing total responses in patients with well documented unilalteral loss, such as due to tumors or severe vestibular neuritis. Rotatory chair -- gain and time constant. The peak gain and the slope of the gain vs frequency curve is another way to estimate remaining vestibular function. Peak gain is useful only for severe loss -- someone with a 100% loss has no gain at any frequencies, including high frequencies (gain of 0). Gain slope is the most useful method of estimating function when high-frequency gain is normal (which is often the case). The rotatory chair data should be a more accurate way of estimating vestibular "function", as the time constant can decline even when the gain remains normal. In other words, the rotatory chair test output, covering more frequencies than the caloric test (which is DC), could encode more information concerning function. As the GainTc product has the highest correlation with remaining function, this implies that it better reflects remaining vestibular function than high-frequency VOR gain or the time constant. We suggest that the GainTc product performs better than Gain or TC alone because of the following observations: Compared to normal subjects, vestibular gain is little changed by unilateral vestibular weakness or loss. However, the time constant is greatly reduced. In patients with near complete vestibular loss, the VOR time constant cannot decrease below that of the mechanics of the inner ear (about 6 seconds) (Wilson & Melvill Jones, 1979), but the gain continues to decrease until it reaches 0. Thus the GainTc product, which is sensitive to unilateral loss from decline in the time constant, and is sensitive to bilateral loss from decline in the gain, correlates better with remaining vestibular function than either the gain or the time constant, considered separately. The VHIT device has no total vestibular response parameter. This is because it measures velocity rather than position. Furthermore the VHIT is limited to high frequencies of vestibular stimulation, predominantly at 2.5 hz (McGarvie, Curthoys, MacDougall, & Halmagyi, 2015). VHIT testing doesn't correlate very well with vestibular loss. It is a reasonable test for unilateral loss however. VEMPs assess the otoliths, not the semicircular canals, and thus are "something completely different". As VEMPs have an "apples/oranges" type input-output relationship -- sound input, muscle contraction output, VEMPs have no direct relationship between vestibular function or vestibular reserve. The most you can say is that they are something measurable that can be followed at different ages. VEMP tests decline greatly with age. Impact of vestibular damage on symptoms. Here is a rough mapping between the amount of vestibular loss, and expected impairments, using anchor points which are well known. This is based on the author's clinical experience. The gain-TC product can be converted into % remaining by dividing by 11.5, and then multiplying by 100. 50-80 5-9 Borderline, mildly unsteady. Typical patient might be vestibular neuritis with partial loss. 30-50 3-5 mild oscillopsia, reluctant to drive in dark. Anchor point is unilateral loss. 0-30 <2 Oscillopsia, sensory ataxia, unsteady. Typical patient might be ototoxicity or idiopathic bilateral loss. Wilson, V., & Melvill Jones, G. (1979). Mammalian Vestibular Physiology. New York: Plenum Press.